Myths are infinitely malleable. They mix and merge easily. The Monster Kid generation, by and large, was also The British Invasion generation, and it was absolutely inevitable that someone would jam together such powerful icons as the Frankenstein Monster and The Beatles. The combination was exploited by novelty artist Dickie Goodman, in 1965. In the manner of, but never attaining the phenomenal success of Bobby Pickett’s Monster Mash, Goodman created a number of monster themed tunes with titles like The Ghoul From Ipanema, My Baby Loves Monster Movies and, ultimately, Frankenstein Meets The Beatles. Listen to it on the net here. Read about Dickie Goodman’s Monster Album here. For anyone who grew up on Frankensteins and Beatles, there’s a Wow! moment in George Dunning’s Yellow Submarine (1968) when John Lennon is introduced, morphing out of a garish, psychedelicized Frankenstein Monster. The cartoon Ringo quips, “I used to go out with his sister… Phyllis”. Ringo Starr admits a love for science fiction and fantasy, witness his posing with Gort, the robot from The Day The Earth Stood Still on the cover of his solo album Goodnight Vienna. He was also instrumental in getting an unfortunate musical comedy called Son of Dracula (1974) off the ground, but redeemed himself with his engaging participation in the delightfully dopey dinosaur romp Caveman (1981). 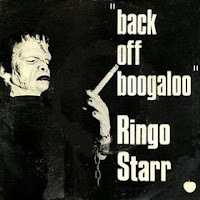 Of more specific interest to us, Ringo embraced the Frankenstein Monster as a kindred soul in connection with a very successful single called Back Off Boogaloo, in 1972. 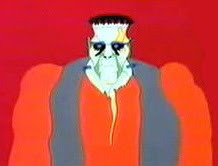 The record's cover features a dour Frankenstein Monster, smoking a large and perhaps “funny” cigarette. A much more agreeable, flower-power version of the Creature co-stars with Ringo in the song's video. See them cavorting together on YouTube. Should anyone compile a list of Frankenstein appearances in popular music or collect Frankenstein and monster novelty records into a single package, I’d recommend using John Bertges’ amazing illustration (at the top of this post) for its cover. The picture masterfully monster-mashes a gallery of movie Frankensteins with the Fab Four’s most famous album image. It was originally posted on The Universal Monster Army’s Yahoo Group website. 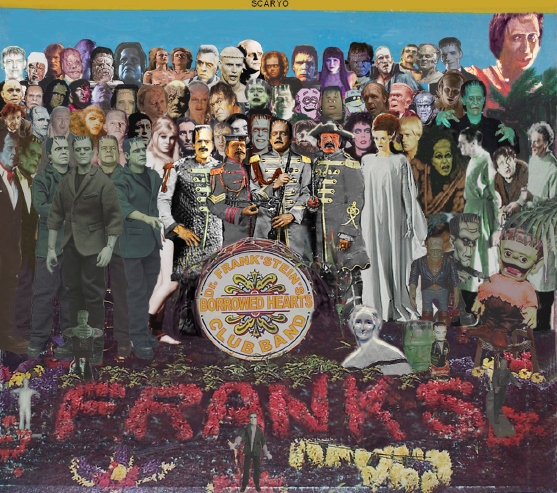 Update: There are many more of Jim Bertges’ ingenious and hilarious Frankenstein/Beatles album cover parodies posted by our friend Max over at The Drunken Severed Head. That album cover rocks. So to speak. Artist Jim Bertges did several other Frankenstein/Beatles covers. Our friend Max The Severed Head will be posting them on his blog later this month. I'll provide a link when he does. David Lee: I'm very happy to see you here. 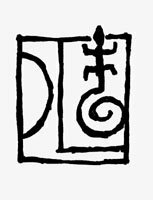 I have a post in the works about your own excellent Frankenstein illustrations!